Even with numerous reboots, resurrections, side projects, and assists, there is always something readily raw and differently addictive about Ty Segall. This time out isn't any different as he sits back behind the drum set of his newest incarnation, Fuzz. Bandmates Charles Moonhart (guitar) and Roland Cosio (bass) round out the heavy psychedelic sound. Interestingly enough, Fuzz did try to escape any Segall expectations. Their first single remained largely anonymous for about 30 seconds (minus 60 seconds) before they were outed. Even if they rightly second guessed releasing the band without Segall's immediate allure, the point was made. Fuzz is a power trio and not the next Ty Segall band. This is something else for him to do when he isn't putting out albums under all sorts of monikers. Fuzz is all about the low-noted bang, haze, and buzz. The music is still scuffed and distorted, but there is something unshakenly unique about heavy-handed rock and roll that has found some common ground between sixties rock and eighties metal. The songs roll alone for several minutes of bass-led sludge before breaking out into exuberant and infectious riff-laden rock. 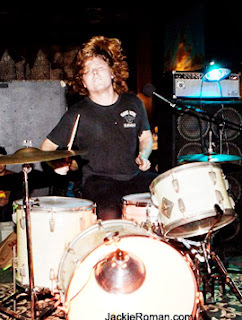 For his part, Segall has adopted some new vocals while he bangs away at the drum kit. He does it surprisingly well. Or maybe there really isn't any surprise at all. He has freewheeled for most of his career. It was only a matter of time before his sticks and a stoner falsetto would be discovered. As an introduction, there is this one relaxed yet riveting video put out by Pitchfork that captures the band. The track, Fuzz's Fourth Dream, showcases the Black Sabbath influences while hinting at how much free play finesse fans can expect to catch at upcoming shows. Fuzz rocks without trying. On the whole of it, the band (much like the song) was inspired by the "Fuzz Face" pedal that lured in Hendrix and Townsend. Segall and company, of course, want to add some campiness to it. Their band bio even claims that they were making music that could "break open the gates of Hades and lurch forward like the rabid hounds of Hell!" And true to their word, starting with the first track and continuing on to the last, the self-titled album from Fuzz rolls off slabs of doomy fuzzed-out psychedelic rock. While it does not include the previously released double-sided single This Time I Got A Reason and Fuzz's Fourth Dream, it does carry eight new tracks starting with Earthen Gate. Earthen Gate makes a statement, alternating between a tease and chug before picking up the pace with a vintage heavy metal romp. The drudge is as classic as the track title. Fuzz immediately slips into its more familiar garage punk influences on Sleigh Ride, named so because there is a certain sense of unbalance that comes with racing down a hill. What's In My Head? caresses some grunge and sixties mysticism. The balance of a brilliant album. Every track has something that helps set it apart. There is the almost wistful guitar work on HazeMaze, the big fuzzed-out stomping sound of Loose Sutures, and the tittering and sometimes out-of-control Preacher to fill in the middle of the album. And then the band brings it home with more galloping garage rock on Raise, followed by the climatic run of One. In this case, they run at you. All eight tracks make a perfect set, something as sharp as any earlier outing with Segall on his own. We're glad that his lifelong buddies could join in on the fun and share in some of the writing duties. The addition of them, right out of the gates, gives Fuzz a heftier but more laid back sound than any previous outing. The Self-Titled Debut By Fuzz Buzzes 8.6 On The Liquid Hip Richter Scale. There are going to be many people who will put Fuzz right up against Slaughterhouse. The comparison is kind of fair, only Fuzz is better. Instead of just coming across as short and crazy, Fuzz feels like there is some substance worth pursuing. You don't want to end on eight or even ten tracks. You can pick the self-titled album by Fuzz from Amazon. You can also download the album from iTunes. The band is currently on tour, playing at a variety of venues across the United States. There is an unofficial Facebook page keeping tabs on the band.